After the Big Bang, the universe contained small density perturbations caused by random quantum fluctuations. These are large enough to form stars and galaxies, but too small to grow into primordial black holes on their own. 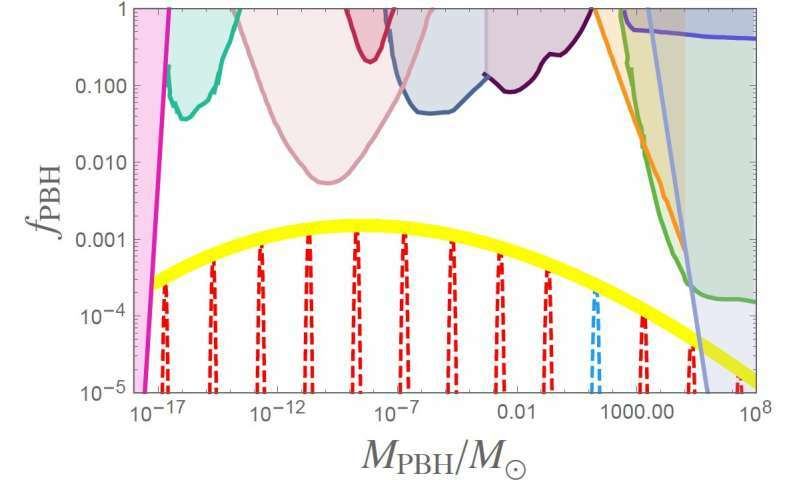 Wang and his collaborators have identified a new resonance effect that makes primordial black holes possible by enhancing certain perturbations selectively. This leads to the prediction that all primordial black holes should have approximately the same mass. The narrow peaks in figure 1 show a range of possible masses as a consequence of the resonance. "Other calculations have different ways to enhance perturbations, but run into problems," says Wang. "We use resonance during inflation, when the universe grew exponentially shortly after the Big Bang. Our calculations are simple enough so that we can work with it. In reality, the mechanism might be more complicated, but this is a start. The narrow peaks that we get are inherent to the mechanism, because it uses resonance." Dark matter; what a terrible solution to the Newtonian math error of masses at galactic scales. To say most the mass is at the edges of galaxies but it's invisible magic matter, is so, so, ummm... stupid. Sorry L. Krauss, you are totally full of BS. "Leiden and Chinese cosmologists have identified a new way in which these hypothetical objects could be produced." ..........nothing like being out wandering around in the weeds & being unable to figure out why you're lost. Displaced dark matter is curved spacetime. 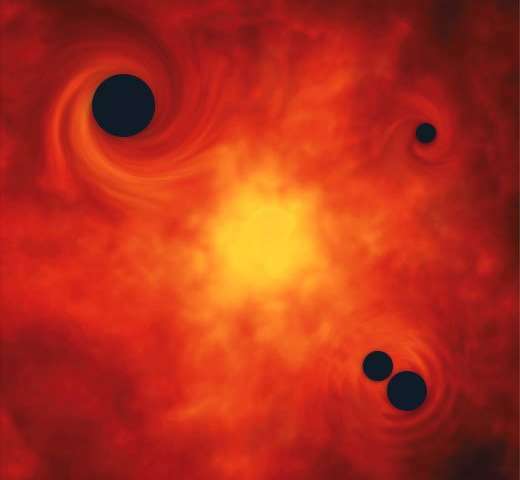 "Cosmologists propose new way to form primordial black holes"
At first glance, I wondered WHY they would want to form black holes, presumably in the lab or LHC. Then I looked again and realised they were referring to HOW Primordial black holes COULD HAVE BEEN created in the early Universe. The title is a mite bit misleading, had it not been for the mention of "primordial". I will talk about the mythical Dark Matter which is alleged to be the 25% of the missing Matter that can't seem to be found. There is Matter/Energy that is (apart from the Matter/Energy that was created already in the known Universe), a Sub-Quantum-scale form of Matter/Energy that emerges or bubbles up out of the Quantum Universe, which then spreads out into our known Universe and interacts slightly with normal Matter/Energy but not too effectively. It is a strangely different kind of Matter/Energy that is slightly reflective so that it can mirror its image(s) onto familiar objects such as Stars, planets, clouds, galaxies. I am not certain if it has anything to do with Higgs Boson, quarks, gluons, etc. but it could be a SubSet of these particles, and are even smaller and exist in a SubSet Universe. Why it should bubble up out of its origins into the Quantum spaces, and from thence into OUR Universe is an unknown...at least, currently. Perhaps a scientist or two will find out. They named it dark 'matter' because it's effects are proportional to an 'm' , a mass, in Newton's equation. Then the science fiction comment loons can come up with their hair-brained but creative solutions in a mere matter of minutes regarding magic mass. Dark gravity is a better name for the effect. Why do black holes have to be formed at the BB? Black holes will be around long after the last stars have burned out. Just looking at the numbers it appears the creation of visible matter was a minor ripple in the turbulence of dark energy. You can't date black holes by their red shift if they don't radiate. The biggest ones may have seen many BBs come and go. They named it "dark matter" because there's something that causes a gravitational effect - that can be observed - and currently the only thing we know of that has gravity is matter. It's a label for an observed effect. Nothing less, but also nothing more. Wait a minute, you're one of the ones who has been here expositing the tale that GRAVITY is DENSITY DEPENDENT, not MASS DEPENDENT. What has changed your mind? .....and the start of your next conundrum. In fact, given the size of black holes which we think could form since the BB, it would be possible to estimate the age of the black holes which we think are too big to be formed in the last 13.7 billion years. Wait a minute indeed. I thought I was the one who thinks gravity is density dependent. You're accusing a_p of agreeing with me? But I'm sure you can provide a link to where I said something to that effect, no? Of course gravity is indirectly (quantized) mass dependent because quantized mass decreases the energy density of expanding spacetime. But the dependence on dark matter is direct. OK, I'll say this again. I'm high so .. Anyway, Coulomb gave us empirical evidence that charge exists. What is charge? I asked. One certainty, it is the geometrical center of an E Field! AHA! Therefore the potential for all things, puny. It is indestructible, unimaginably creative, TA DA! Hitch Hikers Guide to the Galaxy! Narf! HF: so all those particles like quarks are just charge? and so much charge they have mass? So charge has mass? Since you're high I figure you'll answer. Try Logic! Maybe you should get high! Being normal ain't working! Actually this idea with MJ is over 10000 years old. Why dis' .. I haven't seen any form of Logic for over 4000 years. So thought I'd try it. Wait a minute, you're one of the ones who has been here expositing the tale that GRAVITY is DENSITY DEPENDENT, not MASS DEPENDENT. This statement... where would one even begin to correct this damage? Go home Benni: you're drunk; or, if you're a bot: you're broken. Even Cannabis does damage to brain cells. Other junk like opioids will rot out your brain even faster. If you are still a young person, I would suggest that you cease making a junkie of yourself and come back to Reality, else you WILL pay the price for your stupidity in the coming years as so many others have. At least, the ones who haven't died of overdose. Your posts are not exhibiting any Logic, but mostly that you are attempting to work out your delusions in the forums by saying things like your paragraph above. Indeed. Benni is a lost cause. Some sort of mental affliction, I'm guessing. Hey Benni? Still awake? Meds not kicked in yet? What does r-squared mean, Benni? What relation might it have to density? Lol. Bless 'im! Gravity does NOT depend on the density of Mass. There is a lot of space between atomic particles. If those particles were too close together there could be no movement/motion/momentum of Mass anywhere. What is true of the Quantum Universe is also true of our Universe. So Gravity is entirely dependent on Mass itself. If you fall off a roof, it isn't the density of the ground that could kill you, but the Mass which is the ground that you are falling onto. A rocket is in free-fall in outer space with a few bursts of fuel to hold it steady in orbit. But let it get too close to Earth's gravity and it is that gravity that will draw that rocket down to meet the Earth's Mass. IIRC, Charge has Electrons and Electrons have Mass. Only photons are Massless. Electrons run through a wire, producing a magnetic field that keeps the electrons in the wire from losing charge. Egg, thanks, HF does make sense sometimes, he's just...nuts! Let me guess. Maybe mass is density dependent? Charge exists; therefore, any other particle or force is derivative. I'd say so. Charge being the spin of the bosons inside the particle. Bosons give the particle mass and without their spin you can have no charge.Maybe I'm on a high too? If nothing was the beginning; a necessary and sufficient condition is that all charges occupy the same point. Yeah it could be a Black Hole. But show me how God did the assembly! Please mass? Don't make yourself a fool! Logic! Science! Clarity! If nothing was the beginning; a necessary and sufficient condition is that all charges occupy the same point. If nothing was the beginning a necessary and sufficient condition is that nothing occupies the same point. Every set contains the NULL set. You so smart! In the very Beginning, there already was Charge. And the source for that Charge was sub-atomic Particles that existed in the Quantum Universe, the same QU that we are just now getting to know and understand - little by little. There is also a SubSet Universe that is far below the QU that replenishes any Particles that are lost at the Quantum Level. Similar to the chickens producing new eggs. I'm gonna smoke a bong! The universe is infinite, it's hard to comprehend, but harder to comprehend it started just 15 billion years ago. Yes. Charge being the spin of the bosoms and it is the Bosoms that have mass.